Well, if it is any consolation I own three of the dogs that are in the red, but have done for a while, and they have shown some good returns for me so hopefully they will start picking up further again and boost the pot! AstraZeneca had a shocking day today, dragging the whole FTSE down. I’m not concerned right now but don’t relish selling at a loss in 6 months’ time (assuming it remains out of the top 10 yielding stocks). Yes, I spotted your dogs – the returns are good so there is some merit in this strategy (of sorts!). I wouldn’t have the stomach to do this as my only strategy I have to say, but for a small part it does seem to be working! Yes, it’s great when it’s positive! The strategy takes out all the emotion from investing by following set rules. Even if it ends up doing well, I’m not sure I’d be confident enough to run my entire portfolio like this! I may increase my holdings though at some point. I may have to try this method out next year. Looking forward to the next update. I’m surprised that the FTSE100 total return is so low, I thought markets have been surging, but admittedly haven’t looked properly for months now so no real clue on that one! No, you’re right, the markets have been surging but the period I’m tracking is from 10/02/17 (when I bought the stocks), where the return is showing as lower than if I tracked from 02/01/17. FYI, that period would show a total return of 6.19%, which beats my Dogs, but the Dogs are still ahead with the dividends included. I think AZ is a sound company. 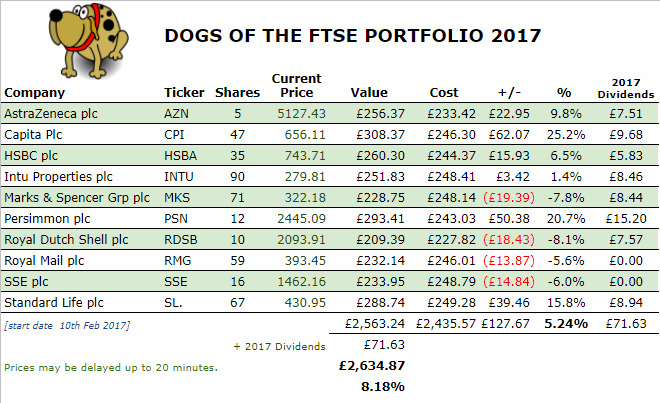 However, I’ll be following the Dogs of the FTSE strategy, so if it’s out of the top ten by end Jan/beginning of Feb, I will sell, whether it’s a profit or not. The good news is that for now, with Royal Mail dropping out of the FTSE 100, AZ is still up there but of course, things could still change over the next few months. Yes, I’m familiar with the dogs. you certainly can’t argue with its track record and its a dynamic strategy for sure. Re royal Mail, The Motley Fool forum were advising us all to invest in Royal mail six months ago, it pays not to listen to advice.